There is nothing we like more than a lechon (roast pork) sandwich on crusty bread, so it goes without saying that we will drop everything to try a new Cuban restaurant in the area. When we learned that Taste of Cuba (3918 W. Touhy Ave, Lincolnwood, IL) was open near our hood we knew we had to try it. We also brought along three Cuban food newbies to convert. Taste of Cuba is located in a small strip mall off Touhy, but the inside is bright and colorful. We were greeted right away by the affable host, who was happy to hear that we had been sampling the other Cuban places in the area. The menu had all of the Cuban classics you would expect, including Ropa vieja ($13.95), Bistec Encebollado ($12.95) and lechon ($12.95) which come with a side and maduros (fried sweet plantains) or tostones. We all ordered sandwiches – a mix of lechon and Cubanos as well a side of maduros. The chef also brought out a free side of yuca fries for us all, with garlicly house mojo sauce, which turned out to be everyone’s favorite side of the da. I also ordered a cortadito ($2.50), which came in a cute little Cuban flag cup, and was very tasty. We got our sandwiches and maduros in short order, and they were generously-sized and made fresh to order. This was definitely some of our favorite lechon in the city – it was tender, flavorful, and the portions were generous. This was some seriously good food, and all of our Cuban foodie newbies were completely sold on this new-to-them cuisine. We topped everything off with a banana milkshake which came in a mason jar and a with a palm tree swizzle stick (nice touch!). We were definitely impressed with everything we had, and Taste of Cuba Cafe place is as good if not better than Cuban joints in the city proper. It is also BYOB! Coincidentally, Taste of Cuba will be opening a branch in the city soon – we can’t wait to try it. We have tried a lot of burger joints in our day, and while we were more than happy that a Shake Shack finally opened in our neck of the woods, it is rare we try a burger place that is totally NEW. Well, Miami, you’ve done it for us again by introducing us to the unique and delicious Cuban burger, the frita. 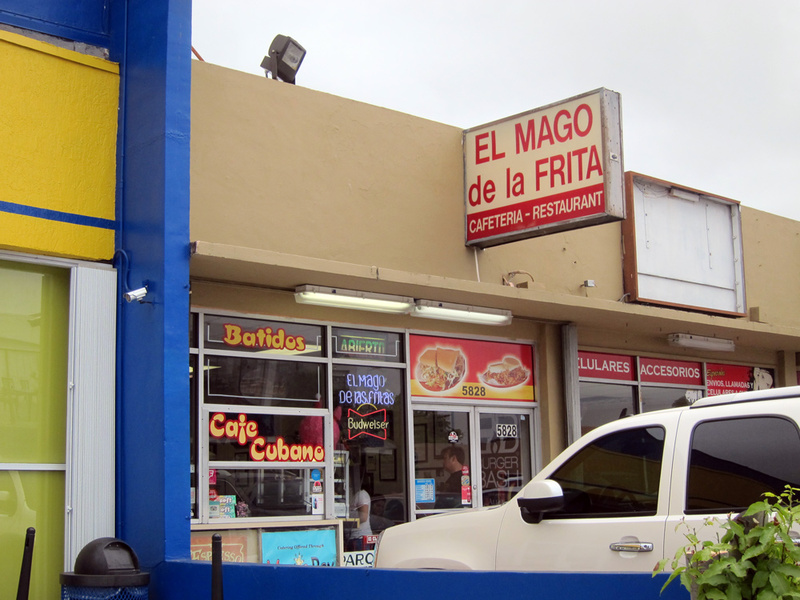 There are a couple of places that claim to have the best fritas in Miami, and we decided to make our first frita experience at one of the fan favorites, Mago “Magician” de las Fritas (another rival across town is Rey “King” de los Fritas). We arrived on Saturday afternoon, and the place was pretty crowded. The Mago himself was even helping man the grill. The restaurant is small and set up like a diner, with a big flattop grill, booths on one side and blue swivel chairs at the counter. There are a number of items available on the menu, including hot dogs, chicken, and steak sandwiches, but rest assured that most people are here for the frita. There are few options for the frita, including a single, double and even one with egg on top (a Caballo). We settled in for our single fritas with a banana shake (mango, guanabana, and others were also available). Now, our only knock on the place is that it took us 30 minutes to get a burger. Sure, we don’t mind to wait a little bit, but it’s a burger…. Despite this setback, the staff was very kind and apologetic throughout. When we finally received our frita, we dug right in. The thin, crispy burger patty was made out of beef and chorizo, and had a spicy, rich flavor. 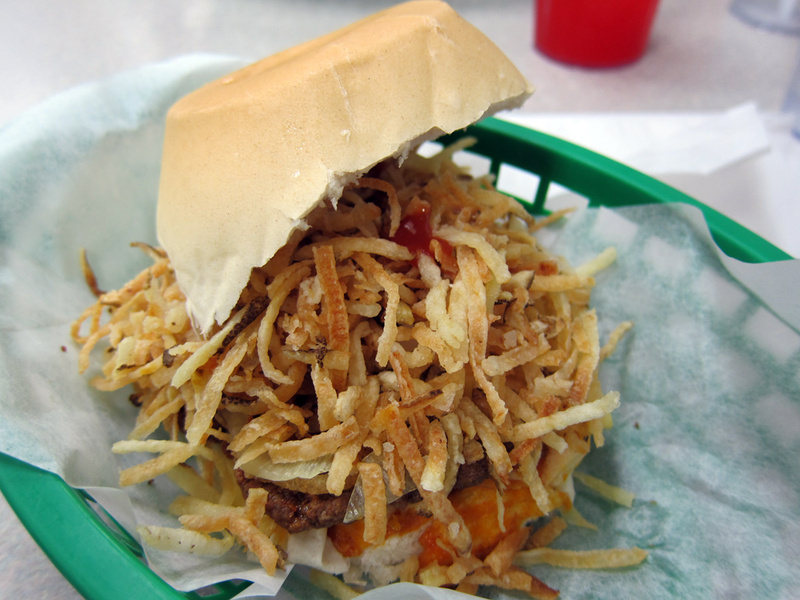 It was also topped by raw and cooked onions, and shoestring potatoes, a Cuban staple, on an egg carton shaped roll. The mix of textures was really delicious, and the chorizo added a whole new dimension. As always, we loved the crunch that the shoestring potatoes added. We are definitely converts to the frita burger, and El Mago de las Fritas was a fun place to try a frita for the first time. Just go when you have time to spare. If there’s one thing you know about M it is that he loves pig: bacon, pork, lechon. You name it, he loves it. We especially love whole roast pig prepared Caribbean style, or as lechon. We have been on the hunt for our favorite lechon in the city for the past year or so, and we have come up with some pretty great options, though the hunt continues. We were going to an event at the excellent SRBCC, and we wanted someplace quick and casual to eat, and came upon Señor Pan. When we learned they had lechon we were sold. Señor Pan is located in a strip mall in the West side, in the Hermosa neighborhood. There is not much to see on the outside, but the inside is much nicer than you would think! It is decorated like a Cuban house, with an indoor trellis and murals. It was impeccably clean and super lively -filled with families, couples and groups of friends. There was also a full bar, but most people seemed to be enjoying the food. The menu is fairly large, with a selection of sandwiches and platters, including the popular Cubano and Medianoche sandwiches. For entrees there were a variety of steaks, chicken, and even salmon and some veggie entrees. We of course went with the lechon. L got a regular lechon sandwich (only $4.95) and M got the lechon platter with black beans and platanos maduros (grilled sweet plantains) for $9.95. However, the star of the show was definitely the lechon – it was juicy, well-seasoned and tender and perfectly complemented by the caramelized onions. The sandwich size was also excellent for the price – we couldn’t believe we got so much food for so little (and the Cuban bread was darn tasty, too). M ordered a banana batido/milkshake ($3.50); other varieties included mamey, mango and strawberry. L also got a traditional Cuban cortadito to finish the meal ($1.50) – a small cup of strong, sweetened espresso. The cortadito was excellent – no bitterness at all! There was also a small selection of Cuban coffee and snacks to take home with you. It also bears noting that Señor Pan has a mascot, who is too funny not to include in this post. Señor Pan was definitely a great, and surprisingly-atmospheric, place for a bite. Go for the lechon and stay for the coffee. Our trip to Miami was a distant memory so we were jonseing for some of the tropical atmosphere. 90 Miles Cuban Cafe (2540 W Armitage Ave) is summer in Miami personified. If you go there on a nice day you absolutely have to eat outside. Of course, it only makes sense that I get around to this post just after our last pleasant day of weather has slipped away. No matter, there is ample seating inside as well. You can spot 90 Miles from afar due to the huge replica of the red, yellow and black southernmost point buoy in Key West – marking 90 miles to Cuba – get it? The menu is Cuban – read: meat heavy – but there are options for fish dishes and even some vegetarian selections. For those going for a lighter feel, you can also get fruit batidos (smoothies), though we always opt for the Cuban coffee drinks. But who are we kidding – we came here for the meat! The sandwiches at 90 Miles are pretty big and you get them with Cuban-style shoestring fries. The Cubano and Medianoche, two Cuban classics are top sellers ($11 each). Both consist of ham, roast pork, Swiss cheese, pickles & mustard, however the Cubano is on French bread and the Medianoche is on a sweeter challah-like bread. They seem appealing, but I always go with the citrus-marinated lechon con pan roasted pork sandwich with a side of sweet plantains ($11). M got the Roast Pork Puerco Rostizado, ($16) pork infused with guava, pan fried with grilled onions, with black beans and fried plantains on the side (15.95). We have also had Ropa Vieja (a beef stew) which was extremely tender and tasty ($16). Everything was delicious, and the lechon, especially so. We love nothing more than Cuban-style lechon, and 90 Miles always delivers. For dessert were were brought straight back to Calle Ocho’s Versailles Bakery with guava pastries and flans. However there are some new touches you may not see in Cuba – the Snickers Empanada – which is exactly what you would expect. We really enjoyed our trip to 90 Miles Cafe – it felt like a little slice of Miami. Logically, you know you are just on a patio in Chicago with some string-up lights, but it really makes all the difference in the world. Even if its a little chilly, there are space heaters…. The menu consists of pressed Cuban sandwiches and hearty side dishes like fried plantains and beans and rice. Fritas, or Cuban burgers, with shoestring potatoes on top, were also on offer. We split a Cubano sandwich and a “Chicken classic” sandwich, which consisted of tomato, lettuce, Cuban grilled chicken and a hearty helping of shoestring potatoes. We also ordered a side of fried plantains. The sandwiches took about 15 minutes to arrive, and as we waited, the growing line snaked across the parking lot. There was nowhere to sit outside to eat, so we snagged a bench on the street, and unwrapped our sandwiches to chow down. The sandwiches were huge (and under $9, so it is a great value)! The Cuban roll was perfectly crispy, the fillings were fresh and the plantains were tasty, if a little mushy. Enriqueta’s is a perfect little lunch joint off the beaten track of Wynwood. If you need a cheap, tasty Cuban fix, definitely give it a try! While sitting outside at Los Pinarenos, sipping our watermelon juices, we looked up at the tree we were sitting under, and grew curious about what kind of fruits it produced. 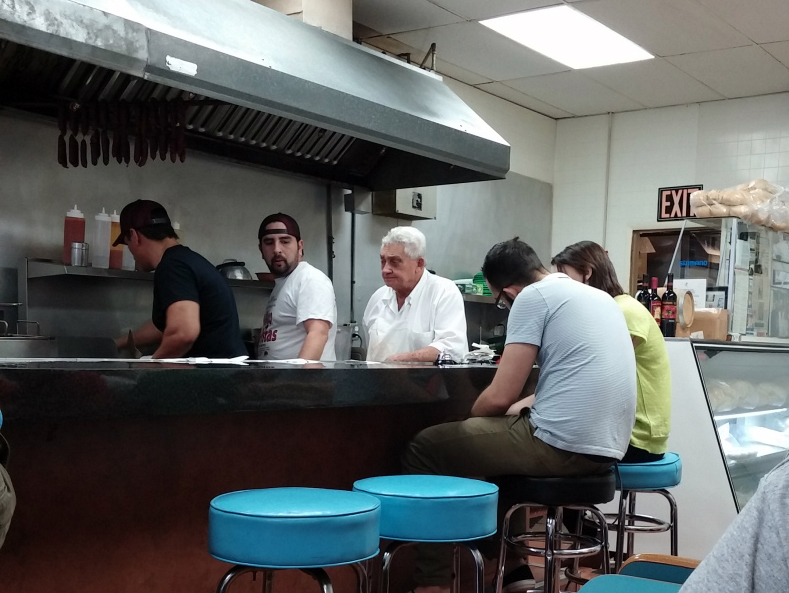 We asked the amiable owner, and he responded it was a zapote. He pointed us to a small group of apple-sized, soft, brown fruits. We had never heard of them, never seen one, and had no idea what they tasted like. So, of course, we bought one! Our zapote, fresh from the tree. Zapote is the Cuban name given to a fruit known widely as the sapodilla, which grows throughout Mexico, Central America, and the Caribbean. Today it is also widely grown in southeast Asia (why didn’t we find it while we were there? ), bring introduced to the Philippines by the Spanish. The taste is difficult to describe, but unlike anything else we have had: semi-savory, with nutty hints of cinnamon, it tastes like a lúcuma crossbred with a honeydew and cotton candy, but without as much sugar. When ripe they are quite soft, with the consistency of a soft melon. As such, you can’t just bite it – you need to scoop it out with a fork or a spoon. Still, the flesh comes out a bit grainy, with flecks of tasty zapote goodness. We were quite mesmerized by this fruit. Has anyone else heard of it? And is there anywhere to get it in Chicago? We’ll keep searching and get back to you. In the meantime, stay tuned for posts from the rest of Miami! Well, we finally managed to make it home from our whirlwind culinary tour of Miami (thanks to the Polar Vortex for the delays)! In the coming days we’ll have reviews of eats around Little Havana / Calle Ocho, Miami’s amazing coffee culture, and why South Beach scares us. But today, we head straight for the reason M loves Miami so much: pan con lechón, a classic cuban pork sandwich. Lechón is a Spanish term for roasted suckling pig (BBQ lovers: note that lechón is NOT smoked, so do not expect a pulled pork sandwich). In Cuba, and especially among Cuban expats in Miami, pan con lechón (literally bread with roasted pig) is a classic lunch. We asked around, and there was near-universal agreement as to where to go to find the best of the best: Papa Llega y Pon, in Miami’s Allapattah neighborhood. When ordering, you are given a choice of sizes for your sandwich (we opted for medium, $6 each) as well as toppings. We went all out and chose both possible toppings, cebolla y picante (onions and hot sauce). At Papa Llega y Pon, the pork is lightly but effectively seasoned, the hot sauce adds a tinge of spice (barely discernible to M), and the onions blend in with the rest of the pork, adding a little extra texture and variety to the flavors. Adding more texture is the obligatory chicharrón (fried pork rinds) mixed in with the pork meat. You can order yours without chicharrón, but you’ll get some strange looks from your servers. Overall, this is simple comfort food, so those expecting bold flavors or exquisite preparation will be disappointed. This is well-made, well-seasoned, and classically prepared food for those who have come to expect the best of the same. It definitely satisfied our lechón cravings, and there is no wonder it is so popular in Miami. NPR’s food blog, The Salt, has a fascinating profile on Cedric Fernando, co-owner of Cuba’s only Indian restaurant. The mission of his restaurant, Bollywood, is to take down the following (quite frequent) question: “Why doesn’t Cuba have any good spicy restaurants?” A Briton of Sri Lankan descent now transplanted to Havana, Fernando seems to be giving the city’s culinary scene just the spicy jolt it needed. Bollywood, which opened last December to exactly zero customers, has taken off as of late. Us visiting won’t do much to change the clientele, apparently – the restaurant seems to cater mostly to foreigners living in Havana and tourists – but hopefully locals will develop a taste for some of the heat that, in our opinion, is all too lacking in Cuban cuisine! 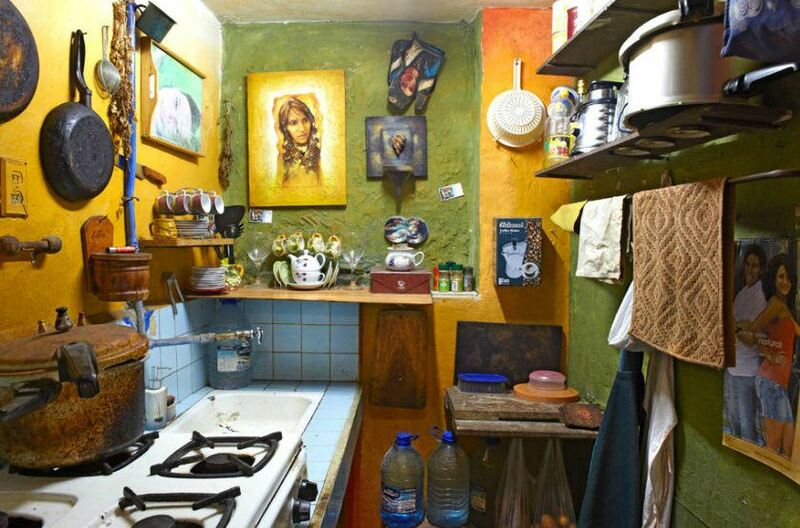 Photographer Ellen Silverman did a wonderful photo series called “Spare Beauty: The Cuban Kitchen,” documenting kitchens around Havana, Cuba, and NPR did a short piece about the project. I’m definitely impressed by the ingenuity and personality of these kitchens. You can see the entire photo series on Silverman’s website. Upon entering Cafecito we had our first sign that it was a hidden gem – directly ahead of us in line was a pack of Chicago Police officers. If there are 8+ police officers in a place at 5 PM on a Saturday, we figure the food has to at least be decent. Cafecito’s laid-back and colorful ambiance welcomed us in right away, and other than the cops, the place was populated by international teens and 20-somethings checking their e-mail – not surprising since Cafecito is connected to a hostel! Cafecito focuses on reasonably-priced pressed sandwiches which are akin to paninis. However unlike paninis, Cuban-style sandwiches are pressed on a plancha grill – and have no grill marks. Cafecito’s most famous offering is their Cubano sandwich, recently rated as Time Out as the best in all of Chicago, which is no small feat. So naturally, when first visiting Cafecito, the Cubano was the sandwich of choice for most of our party. The hefty Cubano ($4.99) consists of the classic combination of roast pork, ham, swiss cheese mustard and pickles. The sandwich comes served on a pressed Gonnella roll (a Chicago touch). The flavors all melded together perfectly but the real standout was the juicy and tender roast pork. We can definitely see why this Cubano has won so much acclaim – our party practically inhaled the sandwiches. Though the Cubano appeared to be the most popular option – Cafecito has other sandwiches are worth noting. We can recommend two sandwiches with an excellent house-made Chimmichurri sauce – the chicken breast sandwich ($5.49) and the Choripan ($5.49) with Spanish chorizo. We finished off the meal with some great, strong Cuban espresso with sugar $1.29 and hot chocolate ($1.99) which was good to take on a cold day to warm up. Cafecito also boasts a dessert counter full of miniature cakes and pasties, however it was pretty much empty buy the time we arrived. We are happy we found Cafecito – it’s a perfect lunch or dinner spot in the south loop – and will be a new go-to whenever we decide to hit the Art Institute. Or we just might make an extra trip or two for the Cubano. In many countries the water and gas industries are nationalized. But how about the ice cream industry? Well, that’s the case of Coppelia, the official ice cream of Cuba. After the revolution, ice cream could not be imported, so Cuba created a homegrown alternative. Every town in Cuba has a Heladería Coppelia, but the centerpiece of the Coppelia empire is located in Havana. The Havana Coppelia building is a mid-century marvel, made of colored glass in steel, and designed by Mario Girona 1966. The whole complex takes up nearly an entire block in the Vedado district of Havana and seats over 700. The Girona building rose to some fame after it appeared in Tomás Gutiérez Alea’s 1994 film Fresa y chocolate (Strawberries and Chocolate). What is interesting is that there are in fact 2 lines at the Havana Coppelia, one for tourists who are paying dollars, and one for locals paying in pesos. Needless to say the tourist line tends to move faster. When Coppelia first opened it boasted more flavors than Baskin Robbins at the time, though a selection 2 or 3 flavors a day is the standard nowadays. The logo of Coppelia stores are ballerina legs, as seen above, surely a reference to the ballet Coppelia. On the front door of the restaurant there is a sign advertising their rendition of pollo a la brasa as “the best Chicken in NYC.” I (L) ordered a lunch portion, a 1/2 a la brasa chicken ($7.55) with a side of plantains. The plate of food was absolutely enormous – the chicken itself had a spice rub and was fall-off-the-bone juicy and tender. While we cannot verify the “Best in NYC” claim – it was some pretty good chicken. M ordered Ceviche de pescado ($9.25) a Peruvian-style fish salad tossed with onions & fresh lime juice. Though tasty, the dish was a little short on the seafood and heavy on the onions. But he was just happy to get some Peruvian food, one of his favorite cuisines. Our Chicago dining buddy Anne, who is now an NYC resident ordered the Sweet and Sour Chicken lunch special (normally off the Hong Kong Specials section) with a side of plantains, definitely the most cross-cultural of our dishes. Though we were expecting more of a fusion of all three cuisines instead of selection from each, we enjoyed our food at Flor de Mayo. I couldn’t imagine a Chinese/Peruvian/Cuban restaurant anywhere but NYC!